I was persuaded to watch Snowpiercer thanks to wildly positive word of mouth. Longtime readers know that I have a particular antithesis to Chris Evans, whom I find to be a terrible actor except in one role (yep, he makes a good Captain America). Snowpiercer may be some of his best work where he goes for a full-fledged performance, and he is much better than someone like Channing Tatum (who doesn't even have a career-defining role like the Cap to fall back on). To combat global warming, nations released a chemical CW-7 to reduce the Earth's temperature. As usual in cases when the cure is worse than the disease, the world went from global warming to global freezing. The entire planet was turned into a block of ice, killing billions of people almost instantly and making the world inhospitable for living. The only survivors are aboard a special train that is perpetually in motion, circling the globe all year round. Seventeen years later, in 2031, the train is segregated by class (or rather, by one's ticket). First Class ticket holders have plush living areas, while those in the back of the train live in squalor and eat manufactured protein bars that make Soylent Green look like caviar. Among those living in this misery are Curtis (Evans), the de facto leader of the train's 99 Percent, the wise old leader Gilliam (John Hurt), and Curtis' little buddy Edgar (Billy Elliot, I mean, Jamie Bell, and BTW, that was not a Jamie Bell short joke). The train's One Percent, embodied in the form of Minister Mason (Tilda Swinton, looking eerily like Ayn Rand) tells them that it is the natural order of things that some be at the top, while others on the bottom. Having this scum at the head of the train is like having a shoe on top of their heads. However, the people will no longer, after all these years, put up with this injustice of living in perpetual squalor and darkness. Curtis launches a revolution to take the train and meet its engineer, the mysterious Wilford. They have to cross train car after train car, where in the course of the film, they capture Mason, we see many die, and when Curtis, aided along the way by a drugged up locksmith they revived named Namgoon (Kang-go Song) and his daughter Yona (Ah-sun Ko), reaches the engine, where Curtis reveals horrifying secrets of his life and learns the truth about the train. In the end though, Namgoon causes an explosion that derails the train, but Yona and a child taken from the back, Timmy (Marcanthonee Jon Reis) venture into what was thought was an uninhabitable world, to see a polar bear and thus, a sign of life. I could argue that Snowpiercer has a lot of logic problems (apart from the idea of a perpetually moving train around the world, though the film did provide an answer to how that was possible). I find it difficult if not impossible to believe that in seventeen years, in a train car(s) where people are living in poverty, things like births and deaths wouldn't be noticed by those in the 'upper' cars. Children would need food other than protein bars to keep going (which somehow is important to the higher-ups) but from what I saw those bars were the only things going. Furthermore, given that in these seventeen years the First Class (and maybe Second Class, because I think that was mentioned) passengers, who supposedly had never seen Steerage, didn't really give a second look or react with any sense of panic that 'the hordes are invading' is similarly ridiculous. However, I don't think that was the point of Snowpiercer: to be 'logical'. It is an allegory about economic equality, on how there are those who have so much and who are keeping it from those with so little. IF you look at Snowpiercer as a form of allegory or fantasy, where we accept the fantasy world we're given (even if it doesn't strictly make much sense), then Snowpiercer can be quite entertaining and visually arresting. The action scenes whenever Curtis and his group are taking the train car by car are well-shot and build to a strong tense feel. Sometimes the action scenes did appear to be a bit silly (the school car being where I laughed at the machine-totting sweet teacher) but I also thought that it was meant more for representation about ideas than to be taken literally (the symbolism of the Wilford worship and crediting him for everything was more a mockery of the cult of the Kim Family Dictatorship of North Korea). In regards to the action and story, Snowpiercer has done better than most in terms of both showing (and in one scene, not showing) violence and in using allegory to present a viewpoint. In terms of the acting, there isn't much negative in it. Bell was the only one I didn't care for, finding his Edgar hopelessly annoying. However, perhaps his ever-chatty Cockney was suppose to be that way, so I'll grant a little leeway. The others made this rather madcap world believable. Evans in particular did his best work: his monologue about his actions in the early days of the train showing he's at least trying to develop as an actor. I don't think he is quite there yet, but I respect him making the effort. Swinton, the oddest actor working today, was brittle and curt as Mason, in turns whimpering and malevolent. On the whole Snowpiercer is not as intelligent as it thinks, and the allegory of a 'people's revolution on a train' isn't as clever as it thinks either. 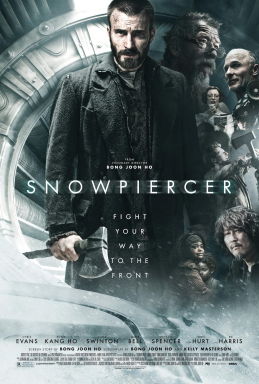 However, as entertainment trying to do something, as a visual ride (no pun intended) and one where one is interested in what happens, Snowpiercer does an admirable job. Snowpiercer is a movie that I was crazy about right after watching, but I have liked it less and less after thinking about it. However, I will think it is certainly a very good movie, but not quite on the same level of my initial review. But getting to see Song Kang-ho together with top hollywood actors was fun as a fan of his work.